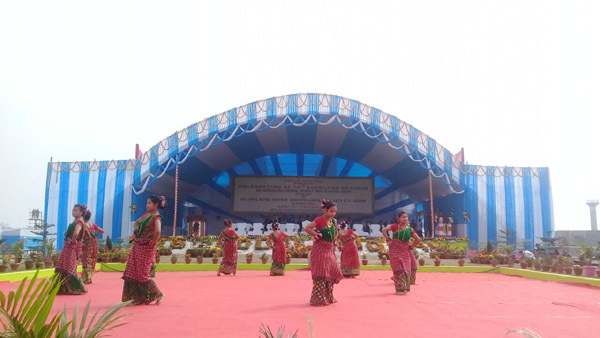 The 16th Bodoland Day was celebrated in a befitting manner at Bodoland Territorial Council Secretariat ground in Bodofa Nwgwr in Kokrajhar with various colourful programs on Saturday. As per the programme, BTC chief Hagrama Mohilary paid homage to the martyrs of Bodoland movement at Bodoland Cementery situated at Debargaon. Later Mohilary hoisted the national flag at the Secretariat ground followed by homage to martyrs. He paid homage and respect by offering flowers at the statue of Bodofa Upendranath Brahma infront of BTC Assembly. A colourful programme showcasing culture of various communities is being held. Assam Chief Minister Sarbananda Sonowal is scheduled to attend the ceremony as chief guest later in the day. BTC chief Hagrama Mohilary, Ministers Rani Brahma, Rihan Daimary, Atul Bora are among those attending the function as guests. Thousands of people are seen throning the programme venue.